I'm *super* excited to have received my first box from Julep Maven. It was here in a FLASH! They shipped the same day I ordered my intro box and it came all the way from California to my home in Winnipeg, Canada in 10 days! I'm impressed. At first I was a little iffy on joining a nail polish beauty box. One of the main reasons is because of the price. 19.99 a month which includes shipping. But, honestly... I'm SO happy now that I did sign up and it's well worth it! I know this will be a favourite of mine! So, the following in what I got in my introductory box and I love it all so far, visually of course! ;) The best part is, it was only .o1!! That's right, 1 cent!! The value of the box is $60. The polishes are $14 each and the scrub is $32. I'm so excited to try it. I've heard a-ma-zing things about this scrub, I'm giddy. :) I'll also be removing my current polish today to play with the glittery one as an accent nail. Potent glycolic acid combined with apricot seeds provides powerful double exfoliation that leaves your hands feeling noticeably softer and looking younger after just one use. Naturally scented with orange oil for a refreshing aromatherapy boost with each use. Next is Brooke polish - Sheer shimmery purple. Use alone or over another shade to add a modern twist. The picture here looks like it has a ton of gold glitter in it, but it really shows up when the light hits it a certain way. It's VERY pretty! Finally, Jennifer polish - Beautiful, sheer polish with just a hint of pink. Love, love this colour! I'm totally into very light colours right now. This pink is perfect! So, the box came like most beauty boxes with the crinkly paper and the polishes were wrapped VERY well in bubble wrap and tied with a pretty pink ribbon! Bonus on the ribbon as I hoard ribbon for paper crafting. ;) They also threw in a basic foam nail file which I'll throw in my purse for an emergency. 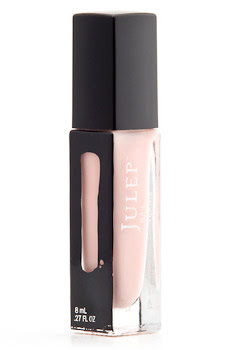 If you haven't joined Julep Maven, you are missing out. My April box is already on the way and I already can't wait to get it! 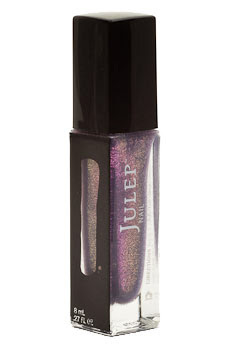 Julep Maven Club! Special Promotion! !